Brewing your own kombucha at home is easy and fun! You can get exactly the flavours you want, and for a fraction of the cost of store-bought. This complete guide, from the proprietors of Kombucha Kamp (kombuchakamp.com), shows you how to do it from start to finish, with illustrated step-by-step instructions and recipes for 286 different flavour combinations. 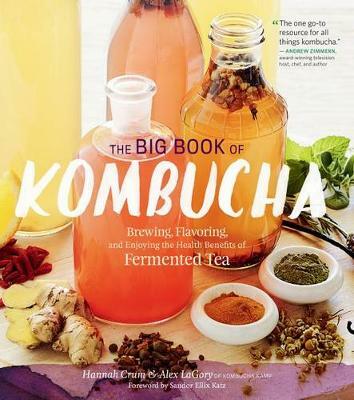 The book also includes information on the many health benefits of kombucha, fascinating details of the drink's history, and recipes for delicious foods and drinks you can make with kombucha (including some irresistible cocktails!). Buy The Big Book of Kombucha by Hannah Crum from Australia's Online Independent Bookstore, Boomerang Books. Hannah Crum and Alex LaGory created Kombucha Kamp (www.kombuchakamp.com) to provide the highest quality brewing supplies, information, and support. Known as "The Kombucha Mamma," Crum speaks at consumer and corporate events nationwide. LaGory is a writer and producer who, with Crum, mentors homebrewers and serves as commercial brewing consultant. The couple co-founded Kombucha Brewers International in Los Angeles, where they reside.